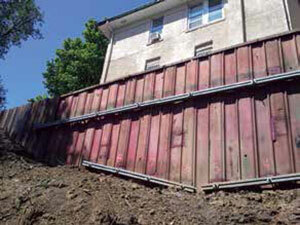 Earth retention systems such as concrete retaining walls, soldier pile and timber lagging, and sheet piling. Seismic loading restraint for foundation uplift and lateral support systems. Guy anchor support for power line and communication towers. 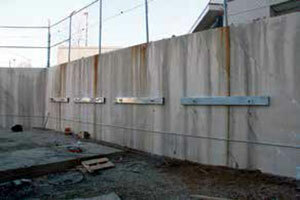 Seawalls and marine bulkhead support. Helical tiebacks are manufactured with similar helix plate sizes and helix spacing as helical piles installed vertically to support foundation loads. Tiebacks differ from helical piles in that they are typically installed in a horizontal to 45-degree downward from horizontal orientation to laterally support the tops of earth retaining structures. Helix plates are typically limited to the lead section or the lead and first extension of the tieback. The helix plate design depends on the soil strength parameters and the required working capacity. Multi-helix leads generally consist of increasing plate sizes from the tip. Helical tiebacks may consist of either hollow round shaft or solid square shaft, although square is more common due to its socketand-pin style coupling (quicker and easier to connect) and the ability to penetrate further into the soil with a similar installation torque than a comparably-sized round shaft. The end of the shaft is typically coupled to an adaptor that transitions the shaft to threaded rod. Both the individual bearing method and the cylindrical shear method are appropriate for determining helical tieback capacity. The torque correlation method is commonly used to verify capacity during tieback installation. Helical tiebacks are often used to stabilize existing earth retaining structures that have experienced excessive movement; i.e., walls that are cracked, leaning and/or bowing. The wall distress may be a result of changes in soil moisture conditions, rise in groundwater levels, plugging of the wall drainage system over time, plumbing leaks, expansive clay soils, frost-jacking, or surcharge loads above the wall.